A lot has been going on this year for me. I have been away from racing for a little while and I have made some big decisions over the past couple months. I am RETIRING from professional cycling, and I am very happy to be moving on to the next chapter in my life. I have been racing professionally for the past 13 years, and they were the most amazing years of my life. The memories and friendships I’ve made along the way will stay with me forever. I have written a blog about what I have been going through over the past couple years with depression and losing the spark for racing. I am very proud of what I have accomplished, and am excited to find that spark in the next adventure and chapter in my life. We’re pleased to announce that Gabby Durrin has accepted a full time position as brand Marketing Executive for Neon Velo starting 2016. 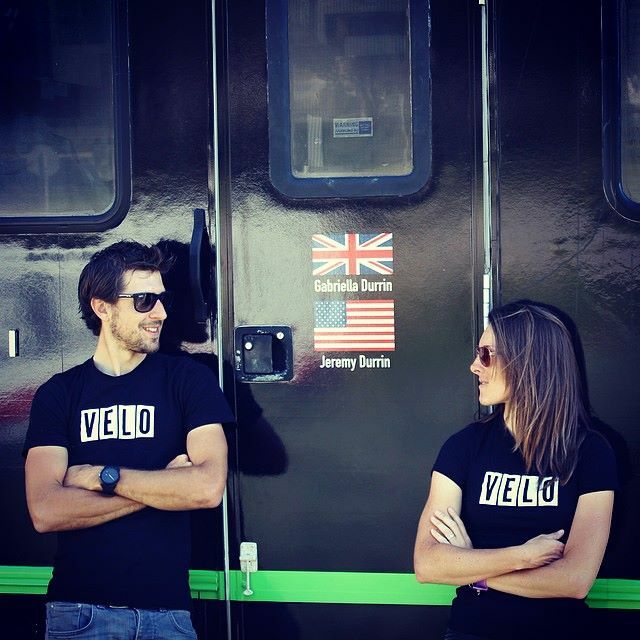 The role comes with a move back to the UK where both Gabby and Jeremy will work closely with Neon Velo brand at their Hertfordshire based headquarters. Gabby will be using her years of experience in the cycling industry to help grow the Neon Velo Brand, it’s Race Team and Products. Jeremy will continue racing for the team on the road and CX primarily in the UK and Europe. Jeremy and the other team riders will also help to further develop the exciting Neon Velo product range through 2016. -Neon Velo’s Emma Backhouse stated. Gabby Posted the following statement on Facebook earlier today. 2016 has a whole new exciting opportunity for me. Thank you all for all the great years, and this won’t be the last of me you will see around cycling. I will update you all soon on what my next adventure is, but it’s definitely exciting! I will be moving to the UK with Jeremy Durrin after accepting a full time position with Neon Velo as brand marketing executive. Jeremy and I will be based in Hertfordshire close to where the Neon Velo HQ is based. I am very excited about this huge change in my life. Having over 12+ years experience in the cycling industry I am looking forward to working on the business side. This opportunity will be great in helping me to transition out of professional cycling and into the business world! Jeremy will still be racing for Neon Velo on the road and in cyclocross primarily in the UK and Europe with an early season USA cyclocross campaign. 2016 is set to be a whole new change and array of opportunities for Jeremy and I. We are both looking forward to the future. I am very fortunate to have this opportunity and it has come at the perfect time for me. Retiring from professional cycling was a tough thing to do and it is rather scary and unknown, but this move certainly allows me to focus on new challenges and experiences which is really what life is all about! Happy New Year everyone. May your year be filled with happiness, health and adventure!